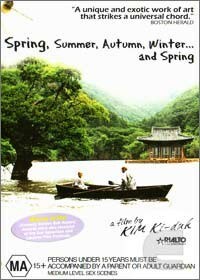 This beautifully written tale is directed by Kim Ki-duk who combines the stunning cinemotography of Dong-hyeon Baek with the tale of a young Buddhist Monk that is being taught the lessons of Buddha by his elderly master. Unfortunately as this boy grows, he soon learns the hardship of a pure life when a mother brings her sick teenager daughter for healing. The boy, now a teenager decides to leave his teachings and follow his pursuit for love in this gripping story that is sure to engage even the most staunchest of viewers. The video quality of this masterpiece is presented in 16:9 enhanced wide screen that has extraodinary clear and sharp pictures with vivid colours of Dong-hyeon Baek's cinematrograph. The audio is unfortunately Dolby Digital 2.0 stereo but fortunately it does not affect this engaging tale one way or another.